The results: The average investor in an equity mutual fund has consistently earned less than either the performance of the fund or the S&P 500…by a wide margin. How bad is it? Shockingly bad. Over the 20-year period from 1995-2014, the annualized return of the S&P 500 Index was 9.9% compared to an annualized return of 5.2% for the average equity mutual fund investor—a difference of 4.7% annually. This “behavior gap” is illustrated below. What Causes the Behavior Gap? In an ideal world, investors are supposed to buy low and sell high. Simple. In the real world, investors do the exact opposite—buy high and sell low—especially during the most volatile times. In the last 30 years, the three months with the most acute investor underperformance were: October 2008 (-7.4%), March 2000 (-6.1%) and October 1987 (-5.3%). Not surprisingly, those three data points correspond exactly with three times of maximum pessimism and panic in the financial markets: the Great Financial Crisis, the Dot Com Bust and Black Monday, respectively. Loss aversion—expecting to find high returns with low risk. Narrow framing—making decisions without considering all implications. Anchoring—relating to familiar experiences, even when inappropriate. Media response—tendency to react to news without reasonable examination. By now, we all know that January was not a good month for the stock market. We experienced the worst first five days of any year ever, and the month ended with a -5% total return for the S&P 500. This was the third consecutive year with a negative January, and the performance was worse than 91% of the last 300 months (i.e., 25 years). Oh, by the way, January was also volatile. Sixty-eight percent of the trading days had gains or losses of 1% or more compared to an average of 23% of all trading days over the last five years. So what did mutual fund investors do in January? Why panic, of course. Consider the data from the Investment Company Institute’s official survey of the mutual fund industry: January’s outflow from domestic equity funds was just about $20 billion. This compares to $25 billion in December 2015 and $171 billion for all of 2015 (a year with an S&P price return of -0.7%, and a total return of 1.4%). And this is no temporary phenomenon. When one looks at a chart that overlays the performance of the S&P 500 with equity mutual fund flows, the correlation is blindingly obvious: dollars follow performance. 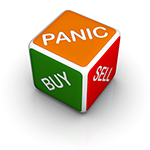 As a general rule, when the stock market goes down, the investing public reacts by selling equity mutual funds. With so much bad news to report, January was a glorious month for the financial media. “The worst [x] days” of any given period always makes a great headline. As an antidote to all this negativity, we thought it might be instructive to put this catalogue of horrible superlatives in historical perspective. According to research by J.P. Morgan Asset Management, a 5% drawdown happens, on average, about four times per year or once per quarter. The table below shows the frequency of different levels of drawdowns and the typical recovery time (in months). In fact, the average peak-to-trough intra-year decline over the last 35 years has averaged -14.2%. If we dare to indulge in the perspective of a 10-year time horizon, we are reminded that the S&P 500 closed at 1,248 on December 31, 2005 vs. a close of 2,044 on December 31, 2015—an increase of 64%. And this 10-year time capsule included, of course, the year 2008, where the S&P 500 had a total return of -37%, the second worst year behind only the -43% of 1931. A good investment counselor needs to help put months like January 2016 in context and remind his clients that this too shall pass. 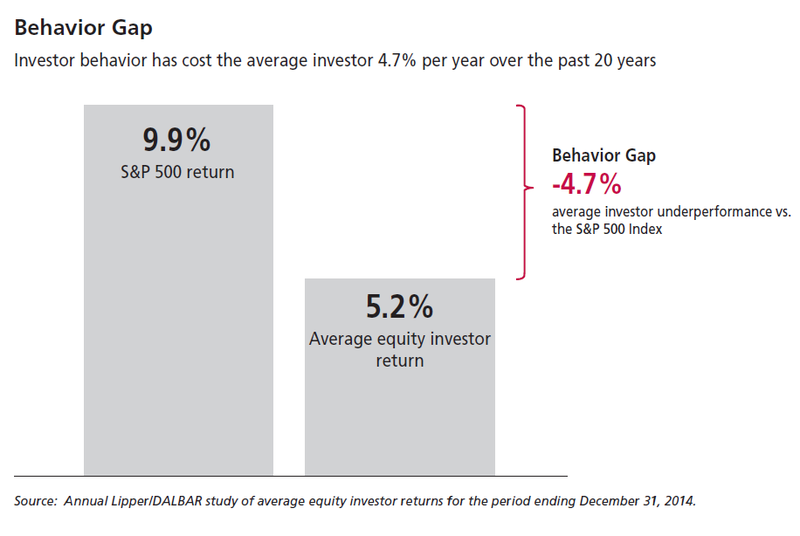 January was a great reminder that investor behavior—not investment performance—drives the outcomes experienced by most investors.